Espirito XVI Cachaça transforms your cocktail catalog unlike any other spirit. Scroll down or simply select "Classics" or "Seasonal" to get started. These classic cachaça cocktails are an excellent choice all year round. Add lime & simple syrup to rocks glass then muddle. Add ice & Espirito XVI Clássico; stir thoroughly. Garnish with fresh lime wheel. Alternate: Add all ingredients to ice filled cocktail shaker, vigorously shake for 15 seconds & pour into rocks glass. •º• The Caipirinha is the National Cocktail of Brazil. Add orange, lemon, jalapeño & simple syrup to rocks glass, then muddle. Add ice & Espirito XVI Clássico, then stir thoroughly. Garnish with jalapeño slice or fresh orange wheel. •º• "Vela" is Portuguese for "Candle." Add non-carbonated ingredients to cocktail mixer and shake 8-10 Seconds. Pour ingredients into copper mug or rocks glass & top with ginger beer. Garnish with lime zest and freshly popped mint. Tip: If not using shaker, muddle jalapeños in glass for full flavor experience. •º• In Brazilian folklore, the Headless Mule is the ghost of a woman -cursed for her sins- condemned to turn into a fire-spewing headless mule, galloping through the countryside from Thursday's sundown to Friday's sunrise. Add fruit & simple syrup to cocktail mixer then muddle. Add Espirito XVI Clássico, vanilla almond milk and crushed ice; shake 10-15 seconds. Pour contents into rocks glass & garnish with fruit. •º• "Batida" is Portuguese for "Crash." Add all ingredients except cachaça to cocktail shaker & muddle. Add ice & Espirito XVI Clássico, then shake 10-15 seconds. Pour contents into highball glass & garnish with cucumber and/or fresh jalapeño slice. Alternate: Add all ingredients to ice filled cocktail shaker, vigorously shake for 15 seconds & pour into highball glass. •º• Loves who you are & loves who you ain't. Strain into champagne flute and top with champagne. Add squeeze of fresh lime & garnish with apple slice and/or lime wedge. Optional: Espirito XVI Dourado can be substituted for Espirito XVI Clássico. •º• Brunch may not be as common in Brazil, but no one will bat an eye if you order breakfast and a cocktail at noon. Add fruit, lime & simple syrup to mason jar then muddle. Add ice & Espirito XVI Clássico, secure lid & shake vigorously. Remove lid, garnish with fruit slice(s) & serve. Optional: Add splash of selected fruit juices to enhance cocktails flavors. •º• Arguably the the most bio-diverse country in the world, Brazil is home to a wide variety of exotic fruits (and endless Caipifruta combinations). Rim collins glass with chili salt or cayenne pepper. Add Ingredients into cocktail mixer and shake 8-10 seconds. Pour contents into collins glass rimmed with chili salt or cayenne pepper. Garnish with celery stalk, green olives, pickled okra and skewer of churrascaria (aka Brazilian barbecue). •º• Brazilians will often add cachaça to their homemade hot sauces. 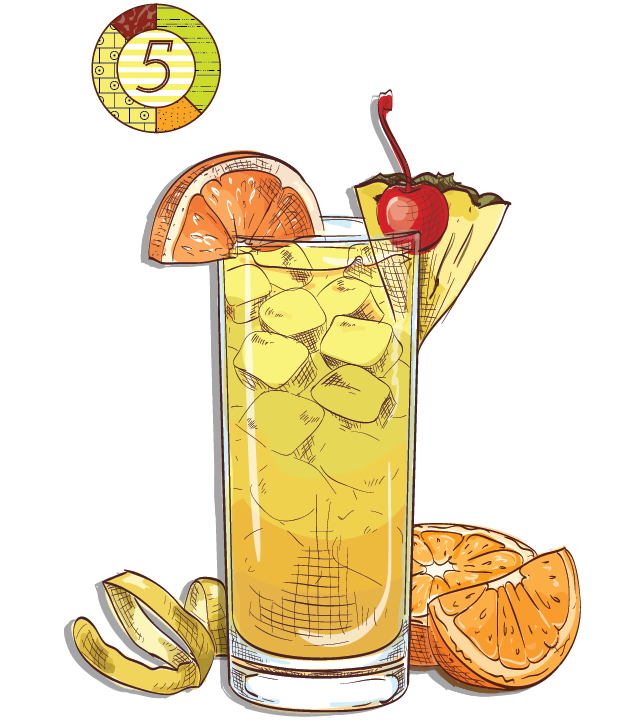 Add Espirito XVI Dourado & pineapple juice to to ice filled rocks glass. Squeeze lemon & stir thoroughly. Top with ginger beer & garnish with lemon wedge/mint. Alternate: Add all non-carbonated ingredients to ice filled cocktail shaker, vigorously shake for 15 seconds & pour into rocks glass. Top with ginger beer & garnish with lemon/mint. •º• The yellow diamond on the Brazilian flag represents the country's vast gold reserves. 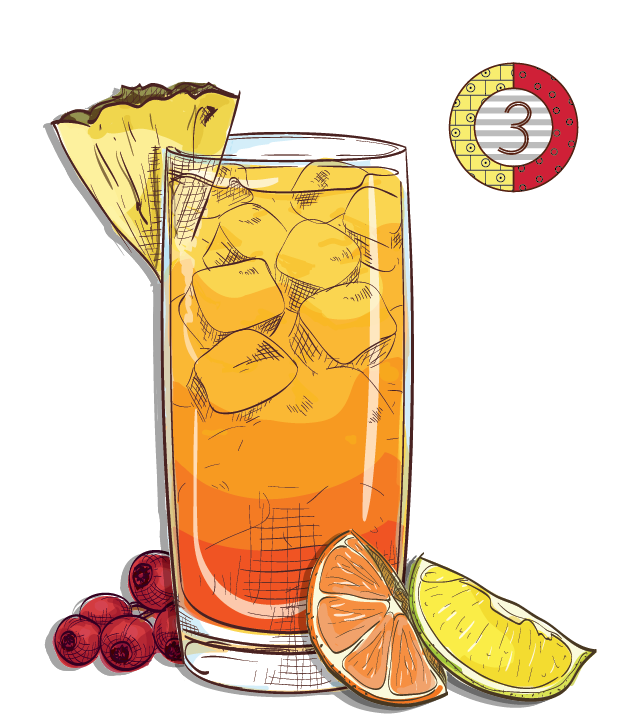 Pour contents into highball glass and garnish with orange wedge and cherry. Add non-carbonated ingredients into mixing vessel and shake for 8-10 seconds. Pour contents into Collins glass, top with soda and garnish with mint. Add ingredients to ice filled rocks glass, stir and garnish with pineapple slice. Add non-carbonated ingredients into ice filled mixing vessel and shake for 8-10 seconds. 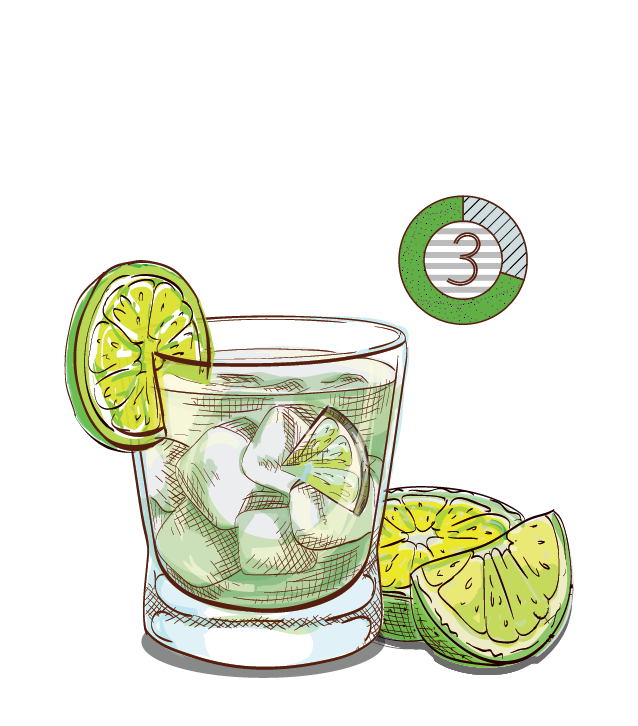 Pour contents into highball glass, top with carbonated ingredients and garnish with lime wedge and mint.